Minutes of Finance SC April 24th; City Council Meeting April 24th, for acceptance. A) Motion Response – Electric Vehicle Charging Stations. There will be additional stations in the Hamilton Canal District and more can easily be added. The six or so in city parking garages and on Warren Street were obtained by grant funds. Council Mercier believes people who use these charging stations should have to pay for them. Councilor Conway askes how much these charging stations cost the city in electricity. That’s $100 or so per month, however, the city owns electric vehicles and is the primary user of these. B) Motion Response – Bike Sharing. Councilor Kennedy says he was disappointed in the report they received, particularly about a planning committee that will be formed. He had hoped that such a committee would already be underway. He points to Worcester as having an established bike sharing program. He says he had hoped this program would be operational by this summer. Councilor Cirillo agrees. Says we should have at least one of these bike sharing programs as a pilot program this summer. CM Donoghue says the updated report given to councilors tonight does show some progress. She wants it to move more quickly but it is important to work with our partners such as UML. Also, there are some legal issues that the law department is investigating. C) Motion Response – Emergency Management Plans. Councilor Nuon asks to refer this report to the Public Safety Subcommittee for further action. Fire Chief Windward says the LFD is creating a 2-hour introductory class (by George Rose) for upper level officials such as councilors to explain how the city’s emergency action plan will operate. D) Motion Response – Condition of Fire Stations 2018. Councilor Nuon thanks the Chief for a detailed report but says it is unfortunate that our existing fire stations are in need of so many repairs. He urges the city to continue seeking funds to make the needed repairs. Councilor Leahy asks that the report be sent to the Facilities Subcommittee for further action. E) Motion Response – Civic Engagement. Councilor Nuon praises the work of Eda Matchak of the Election Office, especially regarding the diversity of city poll workers. She relies on community groups to help recruit workers with the needed language skills. F) Motion Response – Arts Funding. Councilor Cirillo asks Conor Baldwin to elaborate on the report. He explains there are a number of sources of funding within the City Manager’s office that has helped pay for things such as Kinetic Sculpture Race and Kerouac Festival. School Building Committee Recommendation Vote Relative To The Preferred Option For The Lowell High School Project. CM Donoghue explains what happened at last night’s School Building Committee: There were presentations by Perkins-Eastman and Skanska for the three downtown options under consideration. Also presented were cost estimates. Perkins-Eastman reviews Option 2A which would build a new freshman academy and a new gym on the existing site. This would require a temporary gym but no temporary classrooms. This would take 4 years plus a summer. Option 3A would expand the footprint by taking adjacent property by eminent domain. The new gym would be constructed there then the old gym would be demolished so no temporary gym would be needed. Also no temporary classrooms. This would also install “lightwells” into the 1980 building to eliminated windowless rooms that now exist. Option New is an MSBA requirement for an entirely new plan. This also consolidates the campus but it would require 24 temporary classrooms plus a temporary gym. Cost estimate updates: Removing the pool allowed the building to get smaller which helped reduce the estimate. Two independent cost estimators did this and came within 1% of each other. The cost per square foot of $400-$500 per square foot is within MSBA allowances. Option 2A has $262mil construction cost; $333mil project budget; and $124mil city share. Option 3A has $270mil construction cost; $345mil project budget; and $161mil city share. School Building Committee voted last night for Option 3A by a vote of 16 with 1 for 2A and 1 for All New. (Councilor Elliott says he’s a member of the committee but missed the vote last night but wants to be recorded in favor of Option 3A). Registered speaker Mike Dillon says he dislikes all of these options, that the best option has already been passed over. He says we had a great option to build new but a lot of people sold their souls to prevent that from happening. He doesn’t think any of these options are good for the city. Councilor Mercier wants to explain her vote. She says there once was an option that would have taken less time and less money and that was the Cawley option but that lost. She says she has steadfastly said should would not support eminent domain of the doctors’ office. She knows the voters spoke at the voting booth for downtown but she says that meant saving money not taking property by eminent domain so she will vote for Option 2A. She also wants to know what got cut from the project to reduce the cost so much. She then makes a motion that the city lock in the price of $345mil and promise not to go any higher than that. Councilor Cirillo says Option 3A asks about the phased nature of the project, whether some students will be moving into new spaces much sooner than the 5 year construction cost. Yes, after years 1 they will have brand new gym; after years 2 and 3 there will be 64 brand new classrooms; and in successive years there will be additional space. Councilor Kennedy says locking in the price was recommended by the Lowell Sun editorial today, but it would be premature to do that tonight. He says the discussion of the cost will really take place next summer. Councilor Nuon says the cost won’t be fully determined until there is a final design; that this is an estimate. CM Donoghue says that is correct. She says after the MSBA meeting in June the city would move to schematic design. That will last into next summer. That’s when the price will be an issue. She says the MSBA requires the money vote to take place after the schematic design phase so capping it now would be premature. Councilor Conway agrees it is premature to lock in a price. He asks if the actual price might be less. Consultant says yes, because this estimate is very conservative and MSBA might actually allow higher reimbursement. Councilor Mercier asks when we will have a figure on the relocation cost and the price of eminent domain. CM says there will be an appraisal and says the council should know that sometime in the early fall. Councilor Elliott says there are benefits for setting a price ceiling. Vote on CC Mercier’s motion to lock in cost estimate: Defeated 7 to 2 (Mercier and Elliott in favor). Report is accepted and placed on file. Clerk describes process. He will call the roll and councilors will announce their choice. Eight councilors vote for Option 3A; one (Councilor Mercier) votes for Option 2A. Communication – City Manager request Out of State Travel (1) LPD. Vote-Transfer 45,000 to fund school priority projects. DPW explains this will be used for Lowell High and may include other schools that have needs. Vote-Transfer 50,000 to provide design engineering services. This is to help pay the additional money for design work incurred due to design changes, specifically the “new” option and the modifications of Options 2A and 3A. Vote-Transfer 53,525 provide new police vehicle. This money is surplus in this fiscal year so it is being used to purchase a vehicle that was intended to be bought in the next FY. 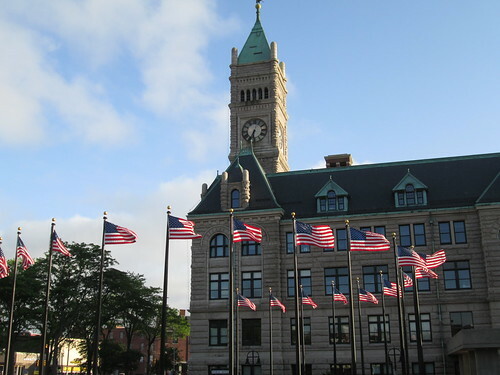 Communication – City Mgr. request approval of Constable Bond for Jason Burke. Technology & Utilities SC May 1, 2018. Claim – (1) Property Damage. Comcast Cable request to amend license for additional storage of flammables 7,380 gals. Diesel (3,690 gals. Class II, AST; 3,690 gals. Class II, AST) at 12 Washer Street. National Grid – Req. permission to install 1,720 feet of new gas main from 1852 Middlesex Street to Chelmsford town line. National Grid – Req. permission to relay existing 2,100 feet of gas main on Chelmsford Street between Howard and Liberty Street. Misc. – Broadway Street Holdings, Inc. (Atty. George Theodorou) request zoning amendment to extend Urban Mixed Use (UMU) district into parcels located at 232 and 234 Mt. Vernon Street; also change of zoning to Light Industrial (LI) at parcels located at 268 and 294 Mt. Vernon Street and 5 Farnham Street. Elliott – Req. City Mgr. have proper department explore repair of Constance Drive and placing same on paving list. Milinazzo – Req. City Mgr. provide a report regarding the 2016 incident in the police detention center as well as all training received by civilian employees since 2013. Nuon – Req. City Mgr. and Human Resource Dept. work with Supt. of Schools and School H/R department to explore means to attract a diverse pool of candidates for future employment openings. CC Nuon says he knows the City Manager and the Council are committed to diversifying the city workforce. He says the school department is hiring some consultants to help them with doing the same thing. Nuon – Req. City Mgr. have Human Resource Department develop a recruitment policy and procedure for hiring purposes. Nuon – Req. City Mgr. take necessary means to repair potholes on Marlborough Street. Nuon – Req. City Mgr. work with various department (ie. Elections Dept.) to begin listening sessions through the Ad Hoc Election Laws SC regarding Voting Rights litigation. Leahy – Req. City Mgr. have proper department review the work being done regarding gas repairs throughout Belvidere. Mercier – Req. City Mgr. honor the commitment by the City to replace sidewalks on Humphrey Street. Regarding this and two above motions, councilors and city manager all express frustration on the state of repairs of streets and sidewalks that are disrupted by utility installations; that the repairs don’t last; that many streets are a mess. What happens with these petitions? Are they simply presented and voted on later or did they get approved? I’m not sure whether they were voted upon or sent to public hearings. Whatever happened, it was very fast and I didn’t catch exactly what happened.